Studies were conducted during the 2001 and 2002 cropping years at Edozhigi and Sachi in the Southern Guinea Savannah of Nigeria to study the effect of following rice with another crop on the next rice crop. There were twelve treatments consisting of poor, good and excellent weed management and pesticidal applications against (AfRGM and diseases set up in a randomized complete block design, in twelve plots in 3 replicates. Results showed that rice treated with gramular isazofos at 0.75 kg a.i. ha–1 and benomyl at 1.0 kg/ha at 20 and 40 days after transplanting (DAT), with good weed management and a follow up crop after rice reduced AfRGM occurrence and disease incidence with a consequent increase in yield of the next rice crop. In 2001 infestation of rice by AfRGM was more at Sachi than Edozhigi, while in 2002 there was low AfRGM occurrence at the two locations. Brown leaf spot was high at the two locations in the two years of the trial while leaf blast was checked by the integrated control methods used in the study. Higher yields were (1.7 - 11.9 t·ha) from treatedwell weeded plots that were cropped to cowpea after the 2001 rice harvest Ludwigia decurens, Sphanoclea geylanica Cyperus difformis and Lepllocidia chinensis were the widely occurring weed species at Edozhigi site while Cyperus difformis, Ipomea mvolucrata, F. awuata and Firnbristylis litoralis were weed species prevalent at Sachi site. The rice nematode, hirschmanniella sp. was recorded at the Sachi site along with other nematodes but was absent at the Edozhigi site. The net benefit farmers would derive for following this rice-dry-season crop sequence vary from US$ 172 - 427 or N 27,520 - 68,320 and US$ 175 - 265 or N 28,000 - 42,400 ha–1 at Sachi and Edozhigi respectively. The National Cereals Research Institute, Badeggi has developed and released many high yielding, lowland rice varieties for increased sustainable crop production in the inland valley swamps. Many of the released varieties have been adopted for cultivation by many farmers in Nigeria. However, some of the varieties are becoming susceptible to the African Rice Gall Midge (AfRGM) . FARO 37 is one of these released varieties. It is widely cultivated especially in and around Badeggi in the Southern Guinea Savannah ecological zone of Nigeria, and is being attacked by the pest. Chemical control of AfRGM has shown good results . Also visual observations seem to indicate that alternating rice with a dry season crop may reduce the damage by AfRGM and incidence of diseases in lowland rice. Hoque  reported the practice of following rice by some short-duration non-rice crops in some developed swamps in some West African Countries including Nigeria. To ascertain the visual observations and exploit the report by Hogue , in the management of the AfRGM, weeds and diseases, a study was initiated in 2001 at Badeggi at two locations— Edozhigi and Sachi—to study the effect of cropping sequence, weeding regimes and minimal application of pesticides for the control of AfRGM and diseases in lowland rice with a view to identifying the most appropriate integrated method(s) for these pests. Two locations—Edozhigi and Sachi—were chosen to study the effect of following rice with another crop on the occurrence of African Rice Gall Midge weed interference and the incidence of diseases on FARO 37 in the 2001 and 2002 cropping seasons. Land clearing was done by slashing the two experimental sites with cutlasses. Bunds measuring 5 cm high were made to check movement of AfRGM from plot to plot. Eighteen plots at both locations left fallow after the 2001 rice harvest were cleared and heaps were made with hoes in early August 2002. The subsequent crop (Cowpea, IAR 48) planted at the on set of rains in May was harvested in the first week of August. Land leveling and puddling were done in late August for both the heaped plots and plots from where cowpea was harvested. Transplanting followed on 22nd September, 2002 at Sachi location. The same operations were carried out at Edozhigi from mid September 2002 and transplanting done on 12 October 2002. Soil samples were collected from all the plots just before transplanting and after harvest for nematode extraction to wusnyigy nematode abundance. The nematode reproduction factor (Rf) was determined from the relation: Rf = Pf/Pi where Pi = initial nematode population. Pf = final nematode population. T1 = Sole rice + 1 hand weeding + isazofos @ 0.7 kg a.i. ha–1 + benomyl @ 1.0 kg a.i. ha–1. T2 = Sole rice + 2 hand weeding + isazofos @ 0.75 kg a.i. ha–1 + benomyl @ 1.0 kg a.i. ha–1. T3 = Sole rice + 2 hand weeding + isazofas @ 0.75 kg a.i. ha–1 + benomyl @ 1.0 kg a.i. ha–1. T4 = Sole rice + no weeding + no isazofos + no benomyl applications. T5 = Sole rice + 1 hand weeding + no isazofos + no benomyl application. T6 = Sole rice + 2 hand weeding + no isazofos + no benomyl applications. T7 = Rice followed by cowpea + no weeding + isazofos @ 0.75 kg a.i. ha–1. T8 = Rive followed by cowpea + 1 hand weeding + isazofos @ 0.75 kg a.i. ha–1 + benomyl @ 1.0 kg a.i. ha–1. 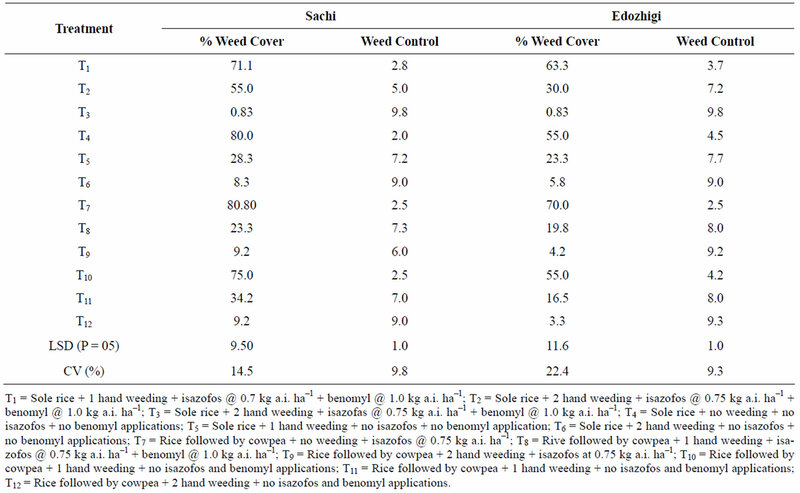 T9 = Rice followed by cowpea + 2 hand weeding + isazofos at 0.75 kg a.i. ha–1. 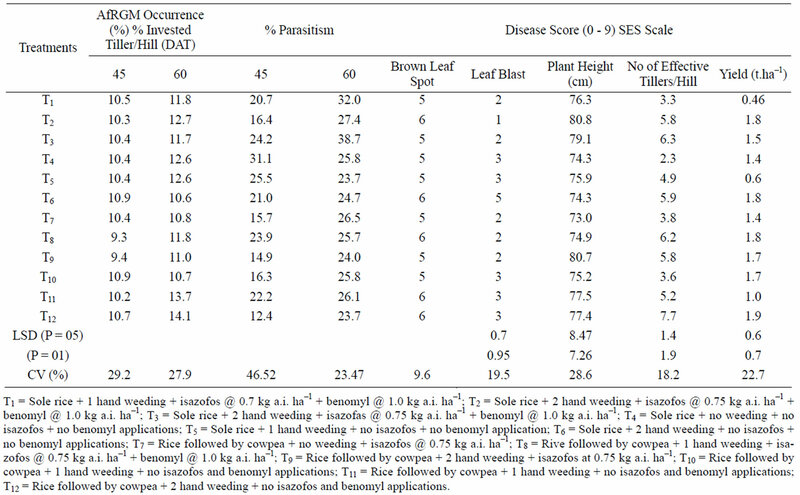 T10 = Rice followed by cowpea + 1 hand weeding + no isazofos and benomyl applications. T11 = Rice followed by cowpea + 1 hand weeding + no isazofos and benomyl applications. T12 = Rice followed by cowpea + 2 hand weeding + no isazofos and benomyl applications. These treatments were set up in randomized complete block design in three replicates. Fertilizer was applied at transplanting at the rate of 50:30:30:NPK and top dressing treatment was given at 7 weeks after transplanting (WAT). Miral insecticide and Benlate fungicide were applied at 20 and 40 days respectively after transplanting. Hand weeding was done at 14 and 30 days for plots receiving 2 hand weeding and 30 days after transplanting for plots receiving one hand weeding. A weed control rating was done on a scale of 0 - 10 where 0 = no weed control, 8 = acceptable weed control and 10 excellent weed control. 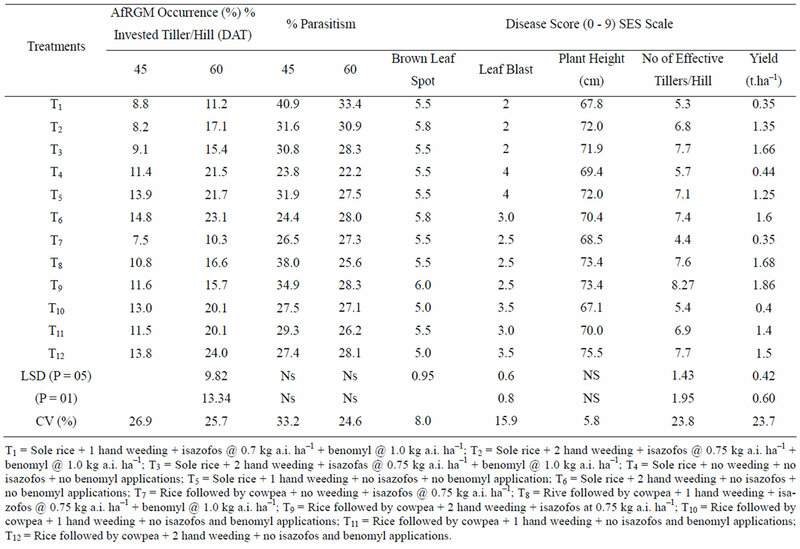 Percentage weed cover in each plot was also determined (Table 1). African rice gall midge infestation was recorded by counting the number of silver shoots per hill for 20 hills per plot at 45 and 60 DAT. Galls were also collected and dissected for percentage parasitism at 45 and 60 DAT. Disease incidence was assessed for the prevalent rice diseases at the two locations using the IRRI standard evaluation for rice, scale (0 - 9) at 50 DAT and at maturity. The weed flora and weed control ratings were recorded at 30 and 60 DAT. At maturity, the number of effective tillers and plant height were taken for 20 hills per plot. At harvest, two outer rows were harvested as discard while the net plot size (3.95 m × 4 m) was harvested and weighed after winnowing. All the collected data except the nematodes extracted from each plot were subjected to analysis of variance and mean separation done by least significance differences. Economic analysis of the subsequent crop was also done. The same weed species widely occurring at each location in 2001 were recorded in 2002. These were Ludwigia decurens, Sphanoclea zeylanica Cyperus difformis and Leptochloa chinensis at Edozhigi and Cyperus difformis, Ipomea involucrate, I. aquatica and Fimbristylis litoralis at Sachi (Table 1). 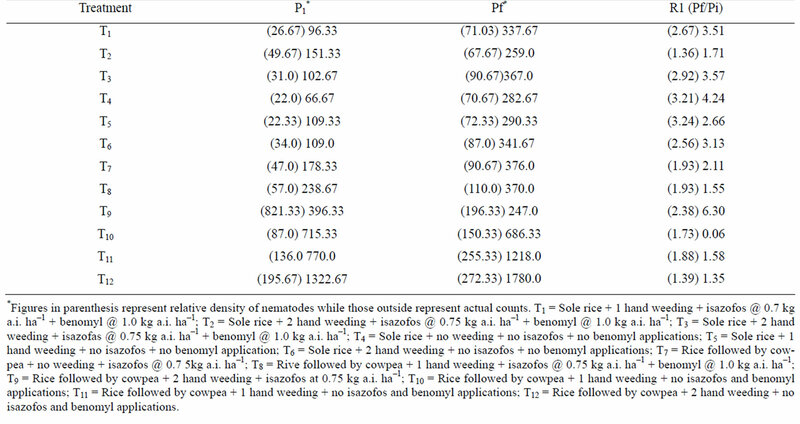 Weedy plots recorded the least rice yields at all the locations (Tables 2 and 3). Yield was significantly greater from weeded and pesticide treated plots that were cropped with cowpea as subsequent crop to rice than the weedy checks. There was also low AfRGM infestation in all the locations both in treated and untreated plots. However, AfRGM infestation was lower from plots cropped with cowpea suggesting that the subsequent crop might have broken the pest’s life cycle. Effect of leaf blast was not adverse on the yield of rice from all the locations, since this pathogen was inhibited by benomyl. The observed high incidence of brown leaf spot at the experimental sites for the two years suggested that benomyl was ineffective for brown leaf spot inhibition. 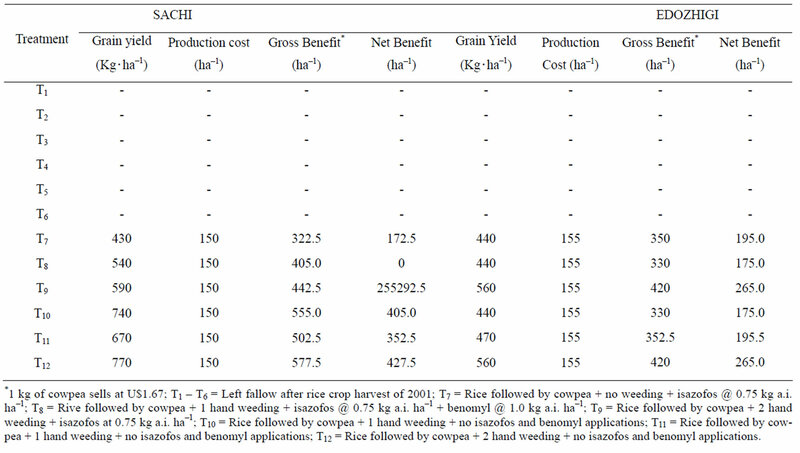 Table 4 shows the economic analysis of producing a subsequent crop on the same plot after rice before the next season of rice. There are clear benefits the farmer would derive from this rice-subsequent crop culture as shown from the net returns in Naira per kilogramme, of cowpea in addition to income from fallow plots after the previous year’s rice harvest. Table 1. Mean effect of treatments on percent weed cover and weed control on FARO 37 at Sachi and Edozhigi 2001. Table 2. Occurrence of AfRGM and incidence of diseases and their effect on yield and yield related parameters of FARO 37 in an IPM trial of Edozhigi 2001 & 2002. Table 3. Occurrence of AfRGM and Incidence of diseases and their effect on yield and yield related parameters of FARO 37 in an IPM trial at Sachi 2001 and 2002. Table 4. Influence of cropping sequence on the occurrence of plant parasitic nematodes on FARO 37 at Edozhigi 2002. Table 5. Influence of cropping sequence on the occurrence of plant parasitic nematodes on FARO 37 at Edozhigi 2002.
investigated in 2001. At Edozhigi, the rice nematode Hirschmanniella sp. was not encountered but other nematode species notably Paratylenchus and Hoplolaimus were present. At Sachi location Hirschmanniella sp. was present amongst others. The trend of nematode population at the two locations could be due to the type of weeds available at each location. Weeds like Galinsoga parviflora, Crotalaris retusa, Desmodium sp., Enphorbia heterophylla, Portulace olearacea and Richardia bruasilensis are known to adversely influence nematode abundance in rice fields . However, none of these weed species was among weeds recorded at the two experimental sites. Further studies are required to ascertain the role of weeds in AfRGM infestation intensity and nematode abundance as well as the possibility of weed species prevalent at each location which could influence nematode abundance as was earlier reported by Bendixen et al. . The authors are grateful to Africa Rice Centre (WARDA) for approved funds for the study and to the Director, NCRI for smooth release of the said funds and logistic support and permission to publish the work. Ukwungwu, M.N. and Joshi, R.C. (1992) Evaluation of Asian gall midge resistant varieties for the African rice gall midge. International Rice Research Newsletter, 17, 12. Hoque, N.Z. (1987) Upland rice development in four west African Countries (Nigeria, Ghana, Liberia and the Gambia). International Rice Commission Newsletter, 36, 32. Bendixen, L.E., Reynold, D.A. and Riedel, R.M. (1979) Annotated bibliography of weeds as reservoirs for organisms affecting different crops, 1. Nematodes. Ohio Agricultural Research Development Centre, Wooster.